In this new age of impish, whimsical, pretty little pixie fairies, like those Amy Brown and NeNe Thomas portray, it’s easy to forget that in times past the fair folk were generally annoying at best, and deadly at worst. The gwyllion of Wales is an interesting example of this. Gwyllion comes from the Welsh word gwyll, which has a variety of meanings ranging from darkness and gloom to a witch, fairy, or a goblin. When a fairy is wrapped up in the same word as gloom and darkness you know this isn’t a Disney fairy we’re talking about. Gwyllion are generally described as hags with a distinctive cry or laughter. Some describe them as having the appearance of poor old women with oblong four-cornered hats and ash-colored clothes. 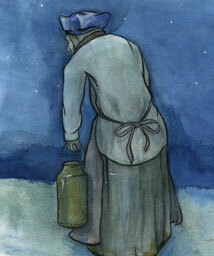 Frequently they are seen carrying a pot or wooden pan, such as people would use to carry fresh milk. The gwyllion follow in the well-established tradition of misleading travelers causing them to become lost forever. Seriously, so many creatures of folklore do this that I wonder if they’re unionized! So a lone traveler is out after dark, or in the early morning hours, walking a familiar path. Then he hears the cry of the gwyllion. Suddenly, the path seems unsure. Up ahead he sees an elderly woman walking. She must know the way, the traveler says to himself. He takes off after her, but never catches up. That’s your standard gwyllion encounter. The gwyllion are known to seek shelter in people’s homes when the weather is bad. If this occurs, you are expected to be polite, offer them clean water, and keep knives and other cutting utensils out of view. Knives, you ask. Yep, unlike the cold iron of most fairy folklore, these guys are driven off by knives. Not being stabbed by them, just seeing them is enough to run them off. Apparently the knife has a superstition attached to it of if you give or receive a knife or scissors it cuts friendship. It also acts like a Cross would to a vampire for gwyllions!